These were taken back in July, before my life became one family emergency after another. A long story short, my father has been in and out of hospitals and rehabilitation facilities every day (except two or three) since July 24, when I drove him for what we thought would be a rather routine surgery. In the middle there somewhere, he did come home for a few days. But that relief --that he was finally well enough to be home--was short lived. In spite of everything--and believe me the list of what he's struggling with is not a short one--he's somewhat stabilized as of this moment in time, and we're cautiously optimistic that he may return home once again in the near future. But one thing we've learned in all this is things can change in the blink of an eye. I also had surgery last week to remove and biopsy an enlarged lymph node I discovered randomly this summer. One of the many things my father has going on is lymphoma, which is actually the very least of his/our worries. I now know more about lymph nodes and what they do and why they become enlarged than ever, and have been tested for lupus, Lyme disease, and who knows what else. In the end, the only way to know for sure what's going on was to remove the largest of the large nodes. So as I type I am a freak of nature! have a drain coming out the side of my neck/collarbone area as I await the results of the pathology tests. So far there is no reason to think it's anything awful, so I've tried not to think about it--which is very easy to do when there are so many other things going on to worry about. Although I'm not really a sailor, I have likened handling the struggles of these past few months (and there is much more to the story than I've shared here) to navigating a sailboat. You deal with the wind as it hits you and adjust your sails accordingly. I'm really looking forward to some calm waters very soon! p.s. Update - I learned today I have Hodgkins lymphoma. Still looking forward to calm waters! on Callis Creek in Redart. I caught him recently searching for supper amid the local oyster operation. All is as busy as--if not busier than--ever in my world. I hope all is well in yours. Lots of exciting things are happening in our little downtown area. efforts are finally paying off, and we're getting a major makeover face lift. Work started on the block near my favorite Mexican restaurant, Mi Casa Azteca. 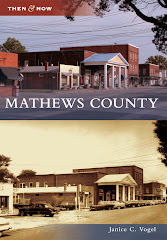 There was some impact to traffic--to the extent Mathews has traffic--and some roads have been blocked off and closed, but all businesses have remained open throughout the reconstructive surgery work. New sidewalks, curbs, gutters and landscaping enhancements are among the improvements being made to our quaint Court House area. Although there may be some minor inconveniences along the way, I personally can't wait to see the end result.